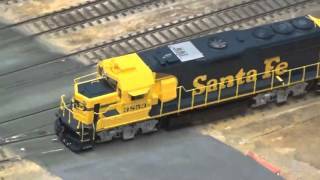 Home Model Trains	Railfanning The San Diego Model Railroad Museum 12/5/15!!! Railfanning The San Diego Model Railroad Museum 12/5/15!!! On December 5, 2015 in San Diego to watch the Denver Broncos face the Chargers for possibly the last time at Qualcomm Stadium, I finally got to go to the San Diego Model Railroad Museum. I had a great time seeing the wonderful layouts of The San Diego & Arizona Eastern as well as their famous recreation of the Tehachapi Pass. In this video, you will see multiple meets, old and new power, various freight loads, and multiple camera angles of these fantastic layouts. Please feel free to like, comment, and/or leave feedback as it is greatly appreciated. Enjoy The Video & Thanks For Watching!!! !